The dual trends of increased remote working and a shift to more open and shared collaborative in-office workspaces are changing how we think about the ways we conduct business. Walls have disappeared, huddle rooms and communal spaces have popped up, and team-based work has begun to replace individual contributions. Which got me to thinking: How truly connected are remote workers? As revealed in a Harvard Business Review poll, the answer may be “not very.” In the poll, remote workers indicated they often feel isolated or left out when it comes to true collaboration with their colleagues. The shift in how people work is accelerating due to the rise of younger, tech-first workers. Millennials aged 21 to 36 -- already the largest generation in the U.S. labor force -- will account for more than 75% of the workforce by 2025, according to the Pew Research Center analysis of U.S. Census Bureau data. Today’s younger workers not only are more comfortable working in groups and collaborating, but also desire an always-on, uber-connected workplace. Additionally, non-integrated software and hardware platforms present various hurdles to a more efficient intelligent meeting. Users struggle with PIN codes, dial-in numbers, passwords, downloads, and plug-ins -- common challenges we’ve all experienced over the years. The intelligent meeting room overcomes these hurdles with integrated hardware that’s powered by smarter software for a more enjoyable experience by both IT and end users. In a Highfive meeting room, participants don’t need to fumble with technology or suffer through a poor quality experience. Rather, they enjoy a more usable, collaborative environment. Highfive has always delivered an integrated, intelligent platform that makes for an easy, more seamless and collaborative meeting room experience. This approach has been the Highfive model, or what we like to call Meetings Reimagined. Highfive delivered the first integrated hardware and software platform more than five years ago, the only video conferencing solution built on WebRTC and running on the Amazon Web Services hyperscale cloud. 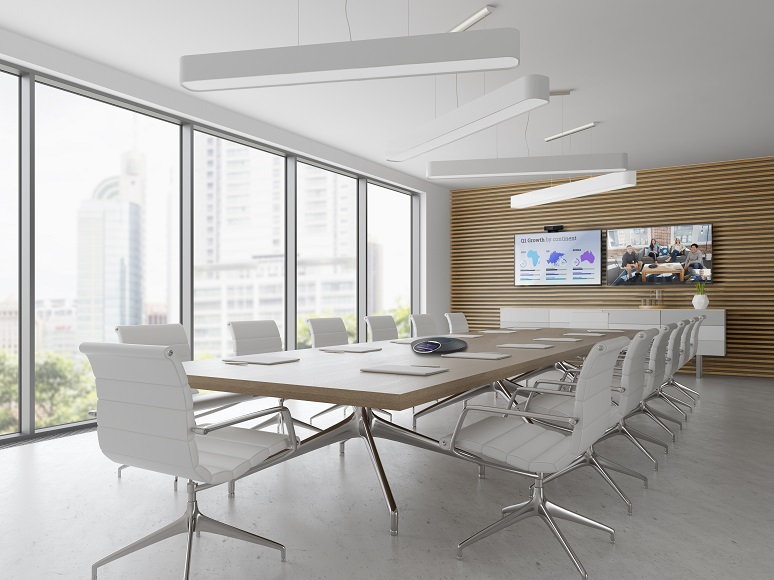 This puts elegant hardware paired with smart software into every intelligent meeting room, delivering the audio and video intelligence needed to deliver exceptional, low-touch, high-quality meetings complemented by enablement, support, and services. Then, Highfive ties it all together with an affordable monthly per-room subscription, eliminating the need and additional cost of individual user licenses. And because Highfive was built on WebRTC from the start, meetings start within the browser with no software download required, and every meeting starts on time with just a single click from any meeting room or any device. With expanding remote workforces, multiple company locations, and more geographically dispersed partners and customers, the intelligent meeting isn’t a nice-have, but a must-have. Video conferencing technology should bring us closer together as our workplaces become more diverse, making us more empowered, efficient, and productive. If you'd like to take a deeper dive into what makes an intelligent meeting work, check out the recent evaluation by Let's Do Video.